Sleep Dealer (Alex Rivera, 2008) is a provocative Cyberpunk dystopia, set in the border between Mexico and the US in the near future. appropriation of technology as a tool for political resistance in the global south. the DSC. All of our events/initiatives are sponsored by the DSC. – Be sure to review the Configuration Changes section of the release notes in docs/release-notes/README-(version) for all versions between your original version and the new version. You may need to manually add new items to your config.inc.php file. In our installation, the folder public/ must be copied from the old installation into the new one, and the “files_dir” must be linked as is currently in the config.inc.php file. This folder should be located outside the ojs installation, or otherwise protected from http access by creating a .htaccess config file, with a “deny all” rule. In the first case (recommended) it shouldn’t be necessary to copy it into the new version, provided that the config.inc.php file has the path to it. Important: the config.inc.php file cannot be copied as is, because the new version includes options that are not contemplated in the old one. I used a program called kompare (a graphical front-end of the diff program, for KDE) to see the differences. The permissions are not set out of the box, the system administrator must apply them manually. This step has given me a few headaches in the past. As I have seen when testing the newest version at the New Media Lab, it has some minor changes in the layout, which will affect the look and feel of your journal. If you have a customized appearance (as LLJournal does, it can be seen at http://lljournal.gc.cuny.edu) you will have to edit the CSS in order to adapt it to the new version. I will analyze the ways in which technology was incorporated into Uruguayan literature in two different historical moments: the publication of Psalmo á Venus Cavalieri by Roberto de las Carreras in 1906, and the publication of the CD rom Árbol veloZ, by Luis Bravo in 1998. Both works had some features in common, such as the accomplishment of certain utopian conception of the book under new technological conditions, and the effort the authors did to bring these conditions to Uruguay, where they were complete novelties, and required the importation of goods that were not locally available. In the case of Luis Bravo, for instance, the importation of the CDs (at a time when there were no local manufacturers) from Canada implied a conflict with local custom authorities. One century before, Roberto de las Carreras imported special typesets from Europe, photographs of the Italian singer Lina Cavalieri, and red dutch paper to create a luxurious book-object, intended to be a jewel. De las Carreras has left a detailed account of the process of elaboration of his Psalmo a Venus Cavalieri in a series of letters he wrote to his friend Edmundo Montaigne, where he exposed his conception of the book as an integral work of art, where graphic design must be as relevant as the text itself. In Luis Bravo’s Árbol veloZ, the introduction describes an utopia of the book as an artifact that allows the reader not only to read, but also to listen and see, as part of a plural sensory experience. Both authors conceived, in different times, a revolution of the book format allowed by new technologies. By the comparative analysis of both experiments in Uruguayan literature, I will show that the authors faced similar challenges to incorporate new technologies in their artistic projects. The comparison will also allow me to consider the issue of the relationship between media and literature from a historical perspective. By 1900, the awareness of the new technological conditions played an important role in Modernista literature, where we could easily find both “apocalyptic” and “integrated” writers, as Umberto Eco put it, even enthusiasts, I would say, of technology. Among the apocalyptic writers, in Uruguay we could signal José Enrique Rodó, worried by the chance that a new technological society could undermine the spiritual identity of Latin America, identified with Ariel, by contrast with a more materialist and technified society, that he identified with Caliban in his classic essay. But among the integrated, the anti-rodosian1 Julio Herrera y Reissig and Roberto de las Carreras were highly interested in bringing new technologies into their own creations. For instance, in the debate about the originality of Herrera y Reissig’s poetry triggered by the prologue by Venezuelan critic Rufino Blanco Fombona to the French edition of Herrera’s poetry (Garnier, 1914), where Blanco Fombona accused Leopoldo Lugones of plagiarizing the Uruguayan poet, Horacio Quiroga told, in response to the accusation, that Herrera y Reissig had listened to Lugones’ poetry beforehand, recorded in a wax cylinder that Quiroga himself had brought to Montevideo in one of his trips to Buenos Aires. This happened by 1900, before Quiroga definitely established in Argentina. Guimarães’ book-object brings together a variety of plastic sensations, visual in the illustrations that populate its pages, tactile in the different textures provided by the different kinds of paper used in its binding. It was also the result of the collaboration of different artists: the Italian painter Scarzolo Travieso, who illustrated the book, and the musician Alberto Nepomuceno, who composed the music for the poems. Psalmo a Venus Cavaliery was an experiment in graphic design, printed in thick hand-made paper of a dark red color, with Art-Noveau capitals printed in gold, a special typeset inspired by old Elzevir printing, bound in leather and closed with satin tapes. The book would finally include a series of pictures of the Italian singer to which the book is consecrated. Written in poetic prose, the author experimented also with the proposal of free verse that Santos Chocano was promoting from Peru, in a programmatic text that appeared in the pages of La revista, the poetry magazine published by his friend Herrera y Reissig. Roberto de las Carreras was aware of the novelty the book meant in Uruguayan literature, and probably in Hispanic letters. However, he stresses in his letter to Montaigne that the display of typographical virtuosity and the incorporation of photographs (a relatively recent technique in graphic design by 1905) were meant to reproduce an archaic object, that would bring back literature to its Greek origins. As paradoxical as it may seem, this interest in recasting the ancestral practice of poetry in the new reality is common to both writers. María Rosa Olivera-Williams appeals to the notion of remediation, coined by Bolter and Grussin, showing how old media is refashioned by the use of new medium. Luis Bravo’s utopian conception for a new book resembles in many aspects De las Carreras project: a collective work, in which many artists take part (hence the signature in the CD: “Luis Bravo + 20 artistas uruguayos”) and the wish that “the sinesthesic motivation, the hunger for images, and the diversity of rhythms of the receptor or listener at this end of the century —and we are positive of the XXI century as well— obtains here the possibility to connect with the ancestral poetical art.” (Luis Bravo, Intro). The material difficulties were also similar in both projects, depending upon material conditions that were not locally available. Luis Bravo was less lucky than Roberto de las Carreras: while the second was finally able to print his “milagro de la tipografía” in Montevideo, Árbol veloZ had to be manufactured in Canada, because there was no CD manufacturers in Uruguay back then. Created in Macromedia Director (now Adobe’s) the work consisted in a binary for Windows (.exe) made with an early version of Flash, very popular among video-games designers, to which, as Jill Kuhnheim notes, the navigation system of the CD rom resembles. When Luis Bravo imported the CD roms from Canada, they were held at the facilities of the Uruguayan custom authorities because he had to pay copyright fees —for a work that he himself had created! After quarreling with AGADU (Uruguayan Author’s association, that should provide the authorization to clear the copyright fee) the CD rom made it into Uruguay, and were published by Trilce together with a book of poetry. The first edition was both the book and the CD rom bound together. Acording to Kuhnheim, these poetic practices can be read as an alternative “to the mercantilization fo image an word through electronic commerce” (ibíd). But as acts of cultural resistance, these poetic experiments meant also an attempt to overcome the technological divide. Although María Rosa Olivera-Williams argues that “la división geográfica entre Primer Mundo/Tercer Mundo o Norte/Sur no parece jugar un papel importante ya que la mayoría del continente está conectado electrónicamente y tiene acceso al resto del mundo” (Olivera-Williams 349), in the works analyzed here, awareness of the differences in access to technology played a role in the conception and the making of both Psalmo a Venus Cavalieri and Árbol veloZ (the second hasn’t been online until very recently, when I myself uploaded some of the videos included in the CD rom)3. The technological divide is not only an issue of access, but rather, in my view, of appropriation of the technologies that make new ways of communication possible. One century ago it had to do to the appropriation of graphic and printing techniques, today it seems to be infrastructures to increase bandwidth, hardware manufacture (in 1998, CD manufacture, for instance) or domain creation and registration. Another issue that aroused with the publication of Árbol veloZ had to do with outdated legal frameworks to respond to a new media reality, that ended up in the retention operated by custom authorities. Access to software itself seems to be less problematic at the moment, mainly thanks to the amazing development of open source software. But by the time Árbol veloZ was created Macromedia Director or the encoders for digital audio (mp3) and video (mpeg) were highly priced and not available at all locally. They were (and continue to be) proprietary tools where the lack of interest in backwards compatibility or cross platform support shown by the companies that own them lead to the obsolescence that renders the appreciation of the work as was first edited impossible. Bravo, Luis. Árbol veloZ: Poemas 1990-1998. Montevideo: Ediciones Trilce, 1998. Print. De las Carreras, Roberto. “Carta a Edmundo Montaigne.” 1903 : n. pag. Manuscript. —. Parisianas. Montevideo: Tall. de A. Barreiro y Ramos, 1904. Print. —. Psalmo á Venus Cavalieri. Montevideo: Tall. A. Barreiro y Ramos, 1905. Print. Herrera y Reissig, Julio. Tratado de la imbecilidad del país: por el sistema de Herbert Spencer. Montevideo: Ed. Santillana, 2006. Print. Kuhnheim, Jill. Spanish American Poetry at the End of the Twentieth Century: Textual Disruptions. Austin: University of Texas Press, 2004. Print. Litvak, Lily. España 1900: modernismo, anarquismo y fin de siglo. Barcelona: Anthropos, 1990. Print. Olivera-Williams, María Rosa. “La nueva vanguardia, tecnología y Árbol veloZ de Luis Bravo.” Arizona Journal of Hispanic Cultural Studies 14.1 (2011): 349-360.Print. 1 Aldo Mazzucchelli has proposed that Herrera y Reissig contested the arielista ideology of José Enrique Rodó in his edition of Herrera’s Tratado de la imbecilidad del país. Roberto de las Carreras has also openly attacked the author of Ariel, in several texts, among them the letters to Montaigne that I quote here. That is why I term the alliance between both writers as “anti-rodosian”. 2 Gustavo Wojciechowski was in charge of graphic design in this publishing group, himself a typographer and font designer, and one of the main innovators in Uruguayan graphic arts. The third issue of the Virtual Poetry Project is out: Achronos, by Ernesto Estrella and Nysos Vasilopoulos. See the new issue here. Achronos is a combination of image, sound and text, which is presented taking advantage of the new features that html 5 offers. The poems are performed by the author himself, recorded and uploaded to the New Media Lab server in vorbis audio format (ogg). The site then will be supported, as is stated in the homepage, by open source browsers, such as Firefox and Google Chrome, or otherwise by a browser that has included support for html 5 and the ogg container, such as the newest version of Opera. The idea is to keep the use of html 5 to its simplest expression, in order to showcase its possibilities for multimedia presentation online. In the first issue of the Virtual Poetry Project, the use of the video tag was showcased side by side with an embedded flash player. In this new issue, no flash alternative is provided, in order to demonstrate that proprietary technologies are not longer needed for media editing, encoding and publishing. Ernesto Estrella Cózar is an educator/poet/performer living in New York since 2000 and teaching as Hispanic Poetry assistant professor at Yale University since 2007. He obtained his Ph. D. at Columbia University’s department of Spanish and Portuguese. As a scholar, he has published critical articles in prestigious international journals, such as the Hispanic Review and the Revista Hispánica Moderna, and his poetic theory volume “Espacio”, poema en prosa de Juan Ramón Jiménez. Centro de una metamorfosis poética went to press in the summer of 2010. In addition, Ernesto regularly teaches workshops that interweave philosophy, politics, arts and ethics. His current workshop, Reading the Poem as Present will be held during January-February 2011 at the Bowery Poetry Club. Aimed at the performative dimension of the poem as sound art, this workshop will be sponsored by the Spanish Consulate in New York as part of their 2011 Cultural program. As a poet, Ernesto was been included in anthologies such as Inmenso Estrecho (2007) and Cuadernos del abismo. (2008). His poetry books Boca de prosas (Mouth of Proses) and Achronos will soon appear in press. He is also currently working on a two-volume poetic novel entitled Escuela de tu nombre (School of your Name). As a performer, his current poetry show, Out of the word, into the sound, uses the voice to investigate the poetic text’s potential beyond its content, as well as the extension of poetic thought through sound. The show presents poems from the Hispanic tradition, the multimedia work “Achronos” (Ernesto Estrella/ Nysos Vasilopoulos), and pure sound pieces. Out of the word, into the sound was partially premiered at the Bowery Poetry Club in NYC, and was performed in the summer of 2010 in Berlin (Wortwedding: Gallery Space for Poetry), Kaliningrad (Slowwwo Poetry Festival), and St. Petersburg (Kitaisky Letchik Club). It will also be presented in NYC at The Tank in December of this current year. At the moment, Ernesto is also working on his next performance, entitled, Opening the Poem, which will include texts in Spanish, English, Greek and Russian. As a result of his collaboration with the Greek musician Stelios Michas, a project entitled Sinfonía Oblicua (Homage to the Uruguayan poet Julio Herrera y Reissig) has been born. The aim of this work, which sets voice and guitar in a compositional/improvisational dynamic, was premiered in Montevideo at the “Veladas Beatnick” in November 2010 and will be performed at the Le Poisson Rouge in NYC in February 2011. This saved my life! I’m currently writing my dissertation, and Zotero offers Linux users (like me) a handy solution to manage bibliographical references. This Firefox plugin allows grabbing bibliographic entries from libraries websites and portals (such as WorldCat). Zotero’s website also provides a plugin for OpenOffice integration, the default office suite in Ubuntu. I think this is currently the best solution in the world of F/OSS for managing and (new since version 2.0) sharing bibliographical references. The newest version can store your entries in a server, in order to maintain them synchronized. They can be also made public or shared with specific groups. It will request to agree to the licensing terms. 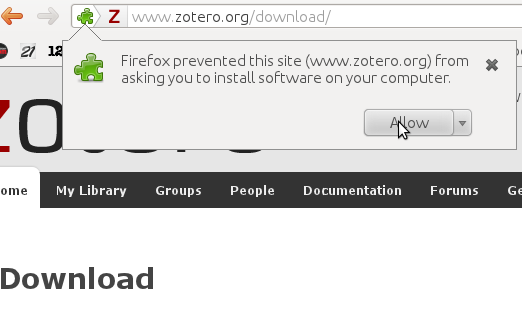 Once installed, you need to navigate to the Zotero homepage (http://www.zotero.org/) using Firefox, and follow the “Download” link. Firefox will then ask if you want to let the site to install software, so allow it to do so. After the installation, you will be asked to restart Firefox. Once restarted, you will be able to see Zotero at the bottom status bar. 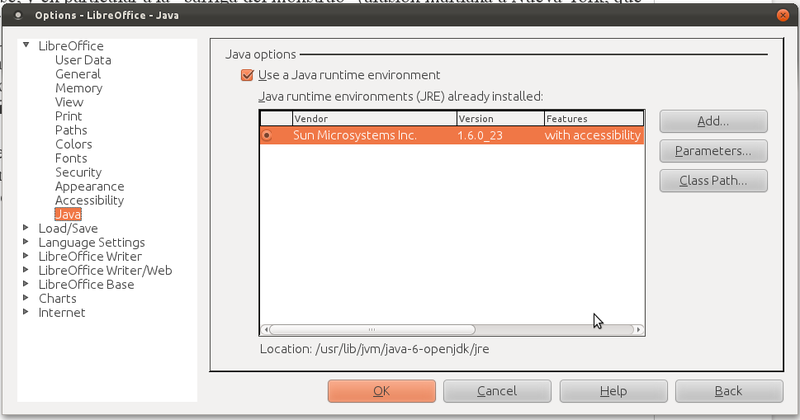 You need to select the java-6-sun version as shown above. Good luck! The practice of poetry writing in Perl (Practical Extraction and Report Language) has expanded since Larry Wall’s first haiku (featured in this issue) appeared in 1991. Poetry can be conceived in Perl in several ways: it can be either an original creation or a porting of already existing poems, such as Lewis Carrol’s “Jabberwocky” or William Blake’s “London”; either executable scripts that provide an output or non-executable (even buggy on purpose) pieces of code. The question of the use of computer programming languages for poetry creation was raised for the first time by the OULIPO group in 1975 (Thomas 26 – 8). But while the members of this group in Europe put the emphasis in the use of software to obtain random syntactic combinations, Perl poetry actually uses code as its targeted media. Larry Wall wrote for the first time a piece where he demonstrated that this potential use of code was indeed a possible practice. His haiku respected the metric and thematic conventions of the genre, bearing a semantic layer at the same time (Hopkins Rauenzhan). Poetry porting, one of the practices carried out by Perl poets, is showcased here by the two above mentioned examples: Eric Andreycheck’ version of “Jabberwocky” and Graham Harwood’s version of “London”. jabberwock.pl is an executable script that follows verse by verse the structure and the logical connections established in Lewis Carrol’s texts. Porting -a term coined in computer sciences to express the adaptation of hardware or software to make them functional in a different environment- can be seen as a form of translation, in this case a translation into a language readable by a machine. On the other hand, Graham Harwood’s texts provide example of poetry written in Perl that go beyond the formal exercise of using code as a mean for poetic creation, and highlights the social and political use of technologies today. His porting of “London” by William Blake transforms the Romantic text into a reflection on the changes brought by technology in forms both of social control and political resistance. Perl is a language optimized for scanning arbitrary text files, extracting information from those text files, and printing reports based on that information. It’s also a good language for many system management tasks. The language is intended to be practical (easy to use, efficient, complete) rather than beautiful (tiny, elegant, minimal). Perl combines (in the author’s opinion, anyway) some of the best features of C, sed, awk, and sh, so people familiar with those languages should have little difficulty with it. (Language historians will also note some vestiges of csh, Pascal, and even BASIC-PLUS.) Expression syntax corresponds closely to C expression syntax. Unlike most Unix utilities, Perl does not arbitrarily limit the size of your data–if you’ve got the memory, Perl can slurp in your whole file as a single string. Recursion is of unlimited depth. And the tables used by hashes (sometimes called “associative arrays”) grow as necessary to prevent degraded performance. Perl can use sophisticated pattern matching techniques to scan large amounts of data quickly. Although optimized for scanning text, Perl can also deal with binary data, and can make dbm files look like hashes. Setuid Perl scripts are safer than C programs through a dataflow tracing mechanism that prevents many stupid security holes. If you have a problem that would ordinarily use sed or awk or sh, but it exceeds their capabilities or must run a little faster, and you don’t want to write the silly thing in C, then Perl may be for you. There are also translators to turn your sed and awk scripts into Perl scripts. Hopkins Rauenzahn, Sharon. “Camels and Needles: Computer Poetry Meets the Perl Programming Language.” Virtual Poetry Project; Vol 1, No 2 (2010): Dossier #2: Perl Poetry (2009): n. pag. Web. Thomas, Jean-Jacques. “README.DOC: On Oulipo.” SubStance 17.2 (1988): 18-28. Print. This piece of code allows the embedding of ogg files, which have buit-in support in the latest releases of Firefox and Google Chrome, and also in some development versions of Opera (this will be implemented probably in the next stable release). The choice of the ogg format was a recommendation done by Opera Software Chief Technical Officer, Håkon Wium Lie, who explained that a royalty free format should be universally supported in the same way the PNG image format is today supported in all browsers. The aim is to make the embedding of audio an video as easy as the embedding of images in html is today. However, the WATHWG (in charge of the specification) got cold feet. They rejected the recommendation advocated by Opera and Mozilla. The change done in the text of the specification can be seen here. The text of You can read more on the controversy in this Wikipedia article and also in the W3C Q&A blog. For a full explanation and examples of code, you can see this page in the Mozilla Developer Center. 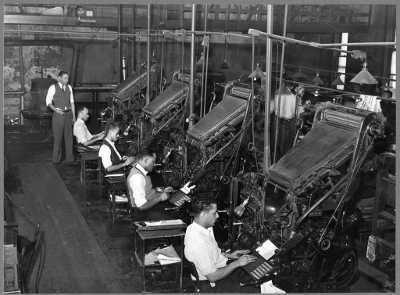 Linotype machines and rotary printing presses were the main innovations in printing technology during the XIX century. The price of a printed publication was significantly lowered, an this allowed a broader access to books and newspapers, as well as the flourishing of new independent publications. 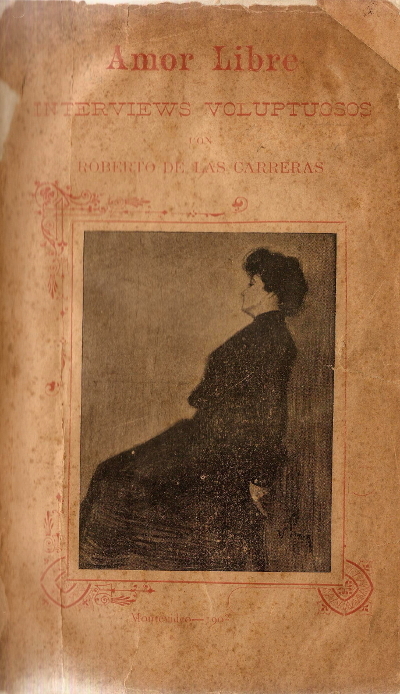 In my current research on the work of Uruguayan modernista Roberto de las Carreras, I can appreciate the importance those new printing technologies had for the establishment of an anarchist press and a series of editorial projects known as Bibliotecas populares, which were key in the diffusion of socialist ideas at the end of the 19th. century. One of the major editorial projects of that time was the Sempere publishing house in Valencia. This house published the firsts Spanish translations of Karl Marx, Michail Bakunin, Piotr Kropotkin, and other revolutionary as well as liberal thinkers. The books were sold at a extremely low price (one peseta) and were widely read not just in Spain (where they were originally published) but also in Latin America (I still have some of those books that belonged to my grandfather). The network built by the internationalists was used by Sempere to reach a wider public. But this network can be appreciated also in local socialist and anarchist newspapers: their correspondence sections were a truly international tribune were socialist and anarchists around the world confronted ideas and coordinated actions. The newspaper La rebelión, which lasted one year (from 1902 to 1903), hosted in its pages a wide range of contributors from Europe and Latin America. Through an economy based in bartering and gift practices, the newspaper editors were able to host in its pages hotted debates where the names of Kropotkin or Élisée Reclus could be seen side by side with a local anarchist baker such as Joaquín Barberena. Anarchists were able to establish their own spot in the cultural realm as holders of the necessary know-how to use the new printing and other graphic technologies (photography starts to become widely available at this time too). Beside printing technologies, advances in transportation contributed to the speed of communications, allowing the editors of La rebelión to send the newspaper to Europe and the Americas, and vice-versa. La Rebelión. 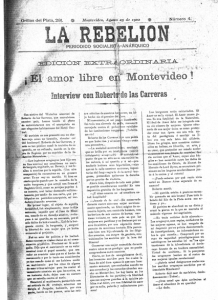 August 25, 1902, announcing the arrival of free love in Montevideo. The debates on free love that took place between 1902-1903 in this newspaper are a good example of such interaction. It was a debate that started as a local discussion held in Uruguay, aroused by the intervention of Roberto de las Carreras, who promoted his own example of free love practice. Soon interventions from Buenos Aires started to appear. In 1903, the intervention from Émile Armand (whose real name was Ernest-Lucien Juin, one of the main advocates of free-love in the first half of the 20th. century, and author of La révolution sexuelle et la camaraderie amoureuse) from France, calls for the creation of a new libertarian community based on the past experiences of the Icaria and Cecilia colonies that existed in the XIX century in the U.S. and Brazil. The debate doesn’t continue because the newspaper is shut down by the police. In the last issues, the changes in the addresses of the printing press facilities evidence the legal troubles the editors were facing. The question that I was asking myself when collecting this data at Uruguay’s National Library last summer was what can we learn from the way these local publishers managed to create such networks, that allowed for a transcontinental cultural exchange bonded by a common political practice. The way they quickly appropriated the new technologies of the time could be seen as an example from which to learn possible practices for the use of the new technologies available to us today. The VPP is the Poetry Project at the New Media Lab. It is a journal dedicated to showcase the use of new media for poetry creation. It is virtual because a hard-copy of this journal cannot be obtained, since it runs in the virtual space provided by an Apache server, and its content is made of bits and pieces of code. Digital formats are the targeted media of these poetic creations. The VPP is also a demonstration of what can be accomplished using open source tools. The multimedia framework used for the development of this project is provided by the UbuntuStudio Linux distro. The journal uses the Open Journal System, and is hosted in a Linux server located at the CUNY Graduate Center in New York. This journal will present a series of dossiers dedicated to particular works, including critical approaches that will offer tools to understand the relationship established between poetic creation and new media. Marshall McLuhan’s proposal stating that “the medium is the message” has been push forward by poets who researched the different media that could serve as material support for poetic expression. Changes in technology and media have affected poetic expression throughout history. The experiments undertaken by Brazilian Concretistas (such as Haroldo and Augusto de Campos) are good examples of how this idea developed: they emphasized the visual, plastic aspect of the written word. Today, with the diversification and availability of digital technologies, poets are making use of the possibilities they offer. The VPP is a space available to connect artists and scholars around the world through web 2.0 technologies, building a web of resources and a network of people interested in these new forms of experimental poetry. The Open Journal System (the software used for this publication) provides tools for the building of an online community of people committed to research the field of poetic expression. Free Love, by Roberto de las Carreras. At this time is being bound the book Free Love, that our comrade Roberto de las Carreras with his pen, a sharp stiletto against the bourgeoisie, is writing. We feel very sorry for some impatient comrades that allowed themselves to criticize the first interview published in this newspaper. After the reading of the book Free Love, they will be convinced that our eulogies to the writer, who adhered to our ranks with unbridled audacity, were not exaggerated. Regarding this new work, from now on we can reveal to the comrades that it will be a vivid example in all literature. There are vibrant pages, his virile heart beats with the impulse of the most beautiful feelings. This Sunday the book on free love written by our comrade Roberto de las Carreras will come out. Free Love is composed of 92 pages of abundant material excellently printed. In its artistic cover, it shows an attractive female figure in voluptuous attitude, abandoned to love. The price of the present edition is of 30 cents for each copy, and the earnings, if any, once the expenses are deducted, will be allocated to publish a novel of social revolutionary propaganda. Order at the offices of La rebelión, Orillas del Plata 281. Published in 1902, Amor libre was an early example of pornographic literature in Latin America, and it was heavily influenced by the anarchist theories on free love, that proposed the abolition of family as a step against the structures of authority in capitalist society. The image in the cover talks to us about the limits of eroticism at the turn of the century. The act of provocation carried by the publication of this book, was a mean of intervention to push forward these same limits. The commercial gimmick of the adds reveal an ironic stand toward the market strategy, placing that same strategy at the service of a revolutionary aim. The use of technical novelties, such as photography, and the selection of a refined set of fonts, were elements that gave this mix of erotica and anarchist theory the appeal of a commodity ready for consumption. The circulation of ideas that anarchist presses allowed at the end of the 19th. Century in Latin America provoked a rather unexpected encounter between the lettered elite and the radical thought that socialists and anarchists were bringing from Europe. According to the adds, the publication didn’t obey to a market calculation. The publisher didn’t expect a profit, and promised to use the potential earnings for a new publication, with revolutionary character. In this case, the economy behind the book is simple: the expensive publication was funded by the author, an extremely rich dandy who allowed himself to donate the potential earnings to the anarchist typographer, so the late can push forward his own editorial agenda. Anarchists and socialists were crucial in defining the trends of cultural circulation at the turn of the century in the Southern Cone, thanks to the expertise several of them had in graphics arts. It is noteworthy that the first unions of workers in that region were established by graphic workers.